The year 2018 is coming to an end and we bet you must be wondering how quick the time has passed. The year was quite eventful, to say the least. 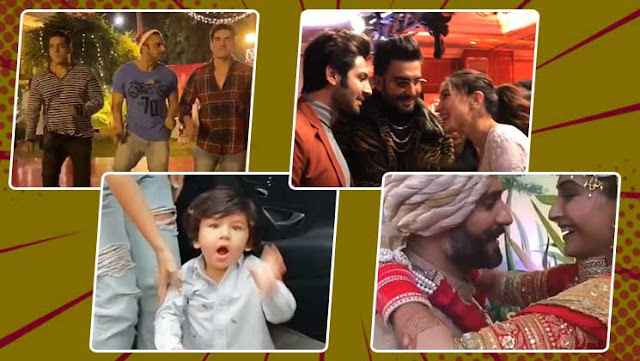 From several Bollywood actors tying the knot to all the three Khans coming under one roof, 2018 has given us a lot of memories to cherish. Now, as the year is about to end, we bring you a list of videos that took the social media by storm. Have a look and get ready to feel nostalgic. Now it won’t be an exaggeration if we say that every picture and video of Taimur Ali Khan takes the internet by storm because the entire nation is a fan of this cutie pie. Since the last two years, Taimur has kept the paparazzi on their toes. However, no one’s complaining because we all love him. The social media platforms can make you an internet sensation overnight and who can be a better example than Sanjeev Shrivastava a.k.a Dancing Uncle? This man’s performance on actor Govinda’s all-time hit song ‘Aapke Aa Jaane Se’ went viral and soon he was invited as a guest on dance reality shows. Sanjeev became so famous that he eventually even got a chance to meet his idol Govinda on Madhuri Dixit‘s dance reality show ‘Dance Deewane’. Sonam Kapoor married her beau Anand Ahuja in May this year. Now, several pictures and videos from her wedding festivities went viral on the internet but there was this one video which melted everyone’s heart. Well, we are talking about the one video where Sonam was heard saying ‘Sorry Babu’ to Anand Ahuja during their wedding ceremony. The actress was immediately reprimanded by her mother who asked her to address Anand as ‘Aap’. Now it’s not every day that we see Salman, Arbaaz and Sohail Khan hitting the dance floor together right? This year, at Salman’s Christmas bash, we saw all the three brothers dancing together and it was truly a gift for their fans. This year has been a great one for both Kartik Aaryan and Sara Ali Khan. The lovely actress expressed her desire to date handsome Kartik Aaryan on Karan Johar‘s hit chat show ‘Koffee With Karan’ and her wish was partially fulfilled when Ranveer Singh introduced her to the ‘Sonu Ke Titu Ki Sweety’ actor at an award show recently. The video instantly became a hit and Ranveer’s expression won the internet. We all love Bhuvan’s insightful take on celeb’s weddings or reception parties. His take on DeepVeer’s Bangalore reception party was literally the most hilarious one. For quite some time now, things are not going well between Salman Khan and Arjun Kapoor. Apparently, the two are not even on talking terms. Reportedly, a rift was caused between them when Arjun allegedly started dating Malaika Arora. At Sonam Kapoor’s wedding, Salman Khan royally ignored Arjun and the moment was captured on camera.